Two years ago I wrote a blog post that started with these words: I’ve kind of sort of recovered a bit from BarCamp London 7 last weekend (part of me is cringing at the sound of that sentence. Seriously, 2009 me? “kind of”, “sort of”, “a bit”?!?). That was the first big event I helped organized. It was manic and stressful and intense, but in the end so so worth it. I guess it’s like running a marathon: you put yourself through hell, but it’s for a good cause and afterwards you can’t help but feel happy you did it. It’s now two years later, and I haven’t stopped with organizing “big” events. Together with Kevin and Cristiano, we’ve done HackCamp, BarCamp London 8, LinkedGov Data HackCamp and the Big Geek Trip. All two day (or longer) events that require more organizing than you’d realize and lots and lots of running around and shouting delegating to people. Plus a bunch of one-day and evening meetups next to all those. The mother of them all though remains BarCamp London, and this year’s one was as manic and stressful and intense as ever. 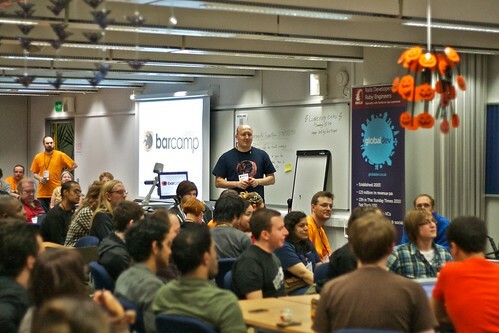 If you’ve somehow stumbled on this post, but have no idea what a BarCamp is, here’s a short explanation. A BarCamp is a two-day weekend unconference, where all attendees are speakers. Instead of pre-announcing speakers, we have a huge grid of session spaces and time slots, where each attendee specifies what they will be talking about. Sessions can be about anything: most attendees will be from the web community, so many talks will be quite “webby”, but I’ve seen a good deal of non-webby stuff to (some of which have been the most interesting sessions I’ve been to). Saturday night the venue remains open, with attendees staying awake through most of the night talking and playing games. Even though a BarCamp is an unconference, there still needs to be a lot arranged. The unconferenc-ey bit comes from there being no pre-announced speakers; everything else though still needs to be managed. 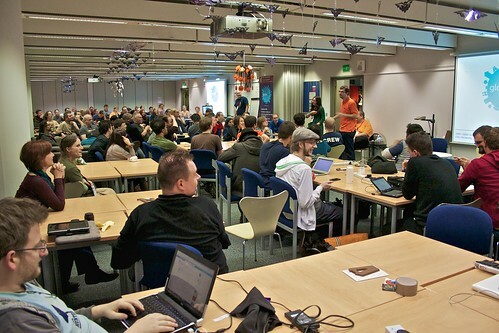 With BarCamp London that comes down to three major elements: venue, sponsors and food/drink. With the venue we were lucky again this year: City University were happy to host us for a second time. Typically you have to pay to use their venue, but we’ve worked closely with City University to get students involved and interested, and for them BarCamp is very much a “free learning” event where attendees are willing to learn and share what they know with others. For them it’s an internal as well as an external event, so they’ve been able to cover a lot of the costs that we haven’t had to (like security, cleaners, etc). It’s amazing to have such a great venue on board, who understand what BarCamp exactly is about. BarCamp is completely free to attend, so we need sponsors to cover all the food and drinks that are consumed during the weekend. I wasn’t that involved with finding sponsors this year, mainly because I was still busy working on my dissertation. It most of the time takes 4-6 weeks to get the sponsoring through with companies, so you’ll need to be looking for sponsors at least 4-6 weeks before the event. I tried emailing some companies 2 weeks before the event, but by then it was already too late: most companies aren’t interested any more in sponsoring that close to the date. We had great sponsors this year though (check out the sponsor page); without them BarCamp London wouldn’t be possible. The last element that needs to be arranged is food and drink. Easy, right? Just order some food and be done with it. Well, no. At BarCamp we do lunch, dinner and midnight snack on Saturday, and breakfast and lunch on the Sunday. Besides that we provide a ton of candy, crisps and drinks during the event. For the main meals, it’s always tricky to find a good deal: we’d love to give attendees something awesome for each meal, but we’re pretty restricted by our budget. Next to that, we try to predict the number of attendees that show up and order the amount of food accordingly, but that involves quite a lot of hassle. For me, BarCamp preparations started two weeks ago. A couple events ago, Kevin had created our own check-in system, called Retain, where we could track attendee responses and turnout. I’ve been heading registration for most past events though, and realized we could do with some added features. 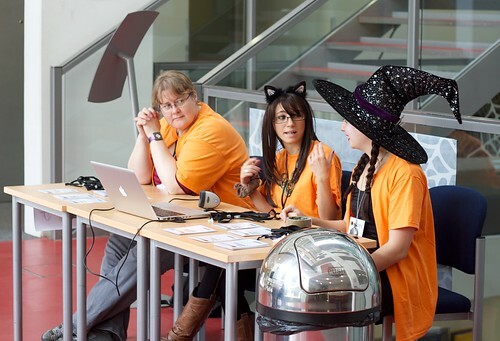 So two weekends ago at the Autumn Hackathon, I mainly spent my time working on that. That weekend I was also trying to arrange a proper breakfast and lunch for the Sunday (hot bacon!) with a pub that shall not be named, but after four days of emailing back and forth with them, they decided they couldn’t do it. Shame. Proper preparations started on the Thursday and Friday before BarCamp. Badges need to be printed, laminated and punched. Rooms need to be photographed (so we could put them back as they were), rearranged and checked. Posters with room names and directions to those rooms need to be hung up (and figure out where we need to hang those up). Food and drinks need to be bought, driven back to the venue and dragged into a crew room. Registration desk and help desk need to be set up. Swag needs to be sorted out and put out somewhere. 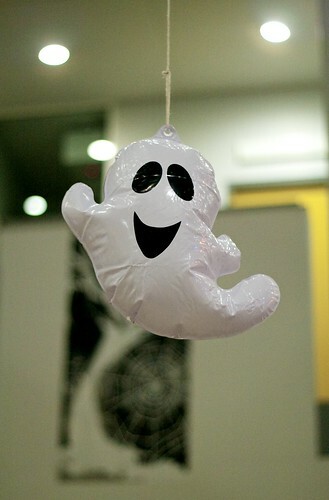 Halloween decorations needed to be put up. There was a ton of stuff to do and not a lot of time to do it in. So: Retain. For the past couple of events, five days before the BarCamp we’ll send out an email asking you to confirm whether or not you’re coming or if you’re cancelling your ticket. If people confirmed their ticket, we definitely knew you were coming. If you cancelled your ticket, we definitely knew you weren’t coming (and could give that ticket away to someone on the waiting list). If you didn’t confirm or cancel your ticket, we gave you a 50% chance of actually showing up and ordered the amount of food accordingly. Then on the day itself we could see in Retain who had confirmed and who hadn’t, and who had shown up and who hadn’t. It made ordering food a bit more exact. For the past events this system has really worked well. And we’ve gotten food orders exactly right. This time around though… of the 250 people who had a ticket, 240 of them confirmed 5 days beforehand that they would come along but 50 of those did not show up. 50 people. It could have been £1500 that we wasted. Luckily it was a bit less than that, as because the pub food for Sunday had fallen through, we were forced to buy food on the Sunday itself (meaning we could get those numbers at least right). Still the food on Saturday was ordered for 250 people, and we wasted money and food, because people didn’t bother to show up. How much effort is it to cancel your ticket? Some people did cancel their ticket on Saturday morning, but by then it’s too late; the food has already been ordered. Most of my Saturday morning I was heading registration, scanning attendees in and keeping track how many people we had in the building. Each attendee badge has a barcode on it, and with laptop + barcode scanners we can check people in and out. The university needs to know exactly how many people are in the building, so we needed to scan everyone that goes in and out. I managed to go to 1 talk that morning, before having to help out with lunch setup. By Saturday afternoon we realized we were “missing” 50 people, and Kevin and me discussed what we could do to help that. We first sent out text messages to the No Shows whose mobile numbers we had, and got some replies (some with family emergencies, some who said they show up tomorrow). It didn’t seem most of those would still show up though, so we also released extra tickets to the waiting list. Only 3 people responded. The rest of Saturday afternoon was reasonably quiet, up until dinner. The pies we had ordered from Square Pie arrived half an hour early, and were already a bit on the cold side, because the driver couldn’t find the place. Argh! We quickly needed to set up dinner to make sure the pies were in the hands of attendees as quick as possible. Turned out though that all the boxes were mixed up. There were 7 types of pies in total plus jacket potatoes for vegans and dairy free people, but everything was through each other. We quickly needed to sort everything in the right piles, so that serving them wouldn’t be complete chaos (and that the vegetarians and vegans ended up with the right stuff). What I didn’t realize was that at the same time, a delivery guy showed up with the ice we had ordered… but he was 2 hours early. Kevin dealt with that, while me and 10 or so volunteers were dealing with the dinner. Somehow though two deliveries were screwed up, causing only more problems on our end. Later that Saturday evening Kevin wasn’t feeling well, so we forced him to go to sleep. It didn’t help, about an hour or so later we found him in the food room counting stuff. We again told him to go sleep, and I would take over and arrange all the evening stuff. Not much to be done, I thought… I was wrong. At about 12, we needed to order pizzas for the remaining attendees. I did a quick head count to see who hadn’t gone to sleep yet, and realized our system was off by about 30 people. Oops. We needed to know exactly who has in the building in case of an emergency. First, I ended up running back to where the pizzas were ordered to lower the amount we were ordering. Then I had to do a second proper head count. This meant asking every single attendee if I could see their badge and re-register them. Including the people who had gone to sleep already. We kind of forgot to specify a designated sleeping area, so somehow attendees managed to go to sleep in every single session room. I ended up having to wake up people and ask if I could see their badge. Not an experience I’d like to go through again. By then the pizzas were about to be delivered and as I was the only one available with a Geeks of London debit card, I had to wait outside in the cold with a couple of other volunteers, waiting for the delivery guy to show up. I realized at that moment that was first time that day I had been outside; I had stayed for over 16 hours straight in that building. Of course the debit card machine wasn’t working properly, and we got charged an extra £10. The manager of that Dominos was supposed to call us back that night to make sure we got the money back, but I think that still hasn’t happened. After that I needed to merge the night head count I had just done into our system. It turned out that attendees had been leaving with their badges, not bothering to be scanned out and messing up our system completely. Of course, Retain didn’t show a list of attendees currently in the building (I forgot to add that bit), so I needed to manually go through all attendees and cross-check their presence with the 2nd list. Not something you want to do at 1 in the morning. Then it was time for the candy round! 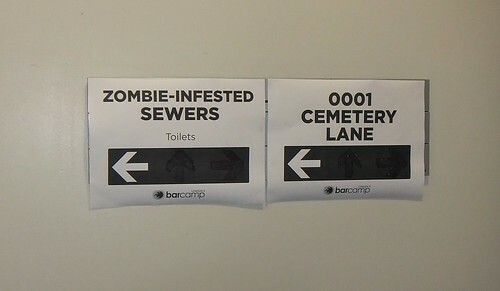 I think that might be one of my favourite bits of BarCamp. Sneaking in to the Werewolf games and giving out chocolate and candy to “sleeping” Villagers. Especially handing out Kinder Surprise Eggs is so much fun; the eyes of attendees just light up and you realize some people haven’t had them since they were kids. Finally at about 2:30, Cristiano forced me to go to bed. I found a nice couch, but it wasn’t exactly the quietest of places, plus my mind was still reeling, wondering if I had done everything right and if I hadn’t forgotten anything. I think I finally fell asleep at 3:00. Three and a half hours later, at 6:30, Cristiano woke me. His turn to sleep. After a quick shower, I headed back to the main area to see what needed to be done. The first thing we needed to sort out was breakfast: how many people were there still in the building and required breakfast. After that head count last night not much had changed, so we had a pretty accurate number. Kevin and some other volunteers went out to get breakfast, while I arranged for the registration desk to be set up again. Around then I found out that my laptop was acting up. Seriously? Right when registration was about to start again? I managed to get my hands on another laptop, and spent the morning trying to figure out what the hell was wrong with it (a fresh install seems to have fixed it). Sunday lunch was a little bit stressful. We somehow managed to get the numbers wrong again and didn’t buy enough lunch. Crew was asked not to eat, so that all attendees at least would have gotten something. It’s so tricky getting this number right though. One time you buy too little, the next you buy too much. How the hell are you supposed to get this spot on? Crew ended up getting food later though, so it wasn’t too bad. Before I knew it, we had the closing talk! It’s an awesome feeling, seeing all those attendees and knowing (well, hoping) they had a great time. After that, it was clean up and break down time. We had about an hour to pack everything up and out of the building. As I said before, we had a lot of “food” (mainly cans of drinks and candy) left over because of no shows, and needed to pack that all up and bring that home. It took a good hour to break everything down. We ended up with two cabs of stuff that needed to be brought home: one cab to Kevin’s with all the stationary, hardware, etc, and one cab to mine and Cristiano’s with all the food leftovers. And that was it. That was yet another BarCamp we had organized. There are a couple of things I am regretting. I only managed to go to 3 talks. Looking at the grid now makes me annoyed about how many interesting things I missed! This time I actually checked the grid a couple of times, but kept forgetting which talks I wanted to go to and got distracted by doing other stuff. Next time around I really need to come up with a way that the main members of crew get to see the talks they want (and get poked by other crew to make them go to those talks). 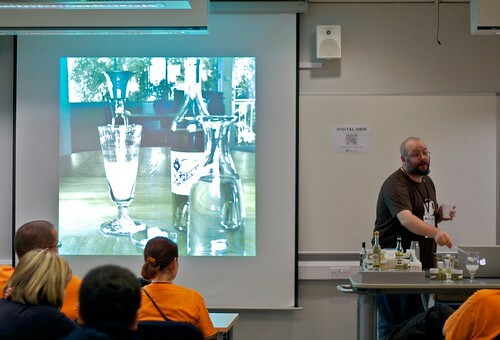 Besides that I don’t think there’s a proper photo of me during the entire BarCamp. There are a couple where I’m sort of in it, but none with really me as a focus. I’m kind of disappointed with that, especially cause I had full on witch makeup and hat on for Halloween! A couple of things before I wrap this up. If you’ve got a ticket to an event and can’t make it, please, please, cancel. This mentality of it being okay not to cancel has somehow got to change. It’s one of the worst issues event organizers have to deal with and this has got to change. Finally, I want to thank everyone involved with this BarCamp. Thanks to City University and Kate for hosting us yet again. Thanks to the awesome building staff (security guys, tech/AV staff and cleaners) who had to deal with this weird bunch of crazy people. Thanks to all the lovely sponsors for enabling us in feeding our attendees. Thanks to all the volunteers who helped out the entire weekend and did anything we asked them to. Thanks to Kevin and Cristiano and the other organizers for making this another fun, even though it is stressful, experience. And thank you to everyone who attended and participated. Without you BarCamps wouldn’t be BarCamps. If you’re interested in hosting, sponsoring or helping to organise future BarCamps, you can contact me at melinda@missgeeky.com.